I had been looking forward to this dive for a long time. Dennis Diamond had originally brought up the idea of diving the Howe Sound Sponge Bioherms, but over several months it just never worked out due to tides, schedules etc. Finally a date was set, and it was on. The weather report for the weekend was terrible. Saturday was rough, windy and rainy. 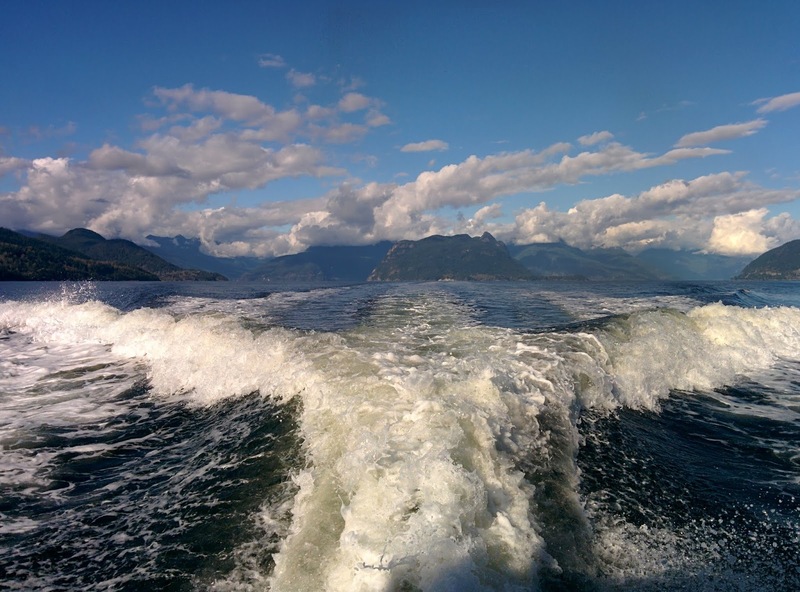 I had gone over to Nanaimo on the Saturday, and the ferry ride was rocky to say the least. I was getting worried! But, I worried for nothing, as the Sunday was perfect with clear skies, no rain, and calm water. It was a bit nippy, but that was it. 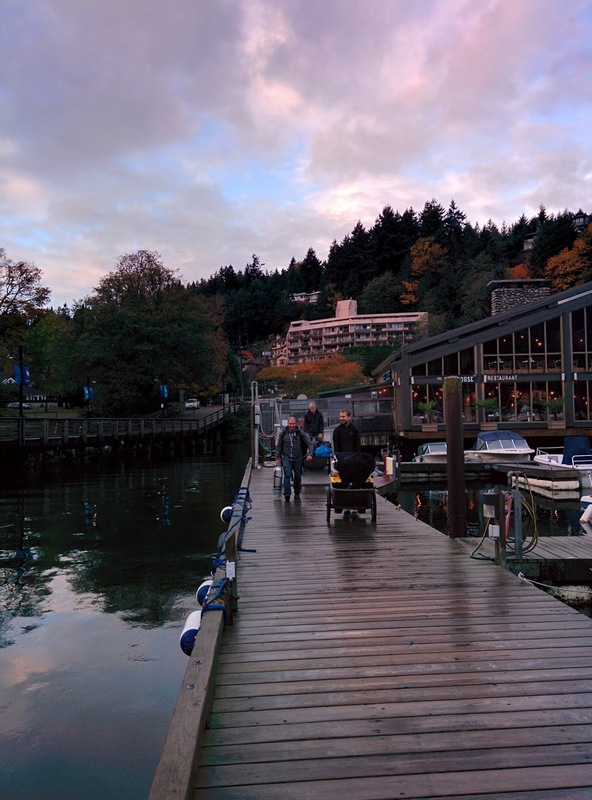 Here was a picture of the marina in the morning. 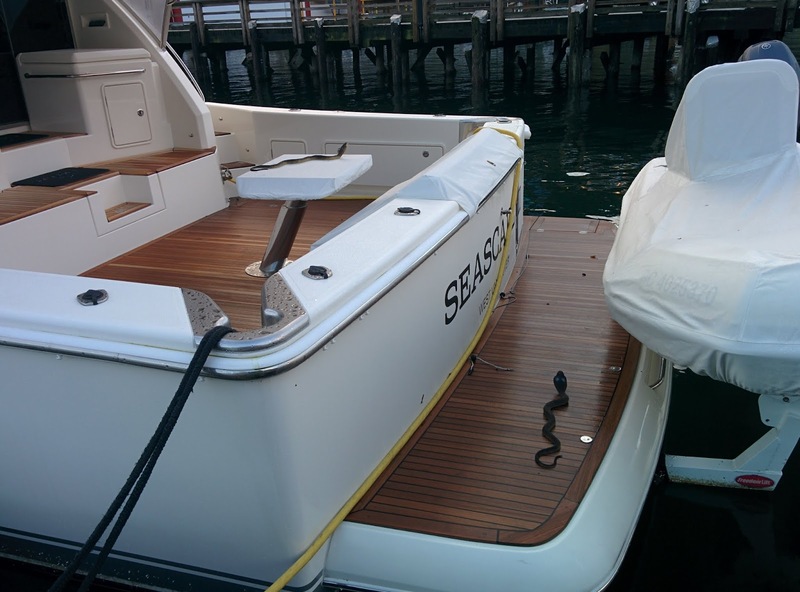 The boat wasn't too full, and we had pretty much the ideal numbers. We needed the extra space, because most of us had a second set of doubles, bottom stages, and scooters. It was definitely a lot of gear to haul down! Here was a picture of Nick, Vlad and boat captain Kevin in the background coming down the dock, all with big smiles for the diving ahead. Kevin was demonstrating how great Sea Dragon Charters always was by helping take some of our gear down to his boat. Thanks Kevin! Once we got all our gear on the boat, it was off to the dive site. Jim Dixon came over from Vancouver Island, and brought presents. A few of us had bought stainless steel adjustable wrenches, and Jim brought them over with him. I snapped a quick group picture on the way out. I didn't get everyone perfectly in the shot, but from left to right: Vlad, Barry, Jan, Jim, Jason, Christina, Rob and Nick. Unfortunately Peter didn't make it into the picture. My apologies Peter. This was the view from the rear of the boat, showing just how fabulous a day it really was. The dive on the sponge bioherm went flawlessly. 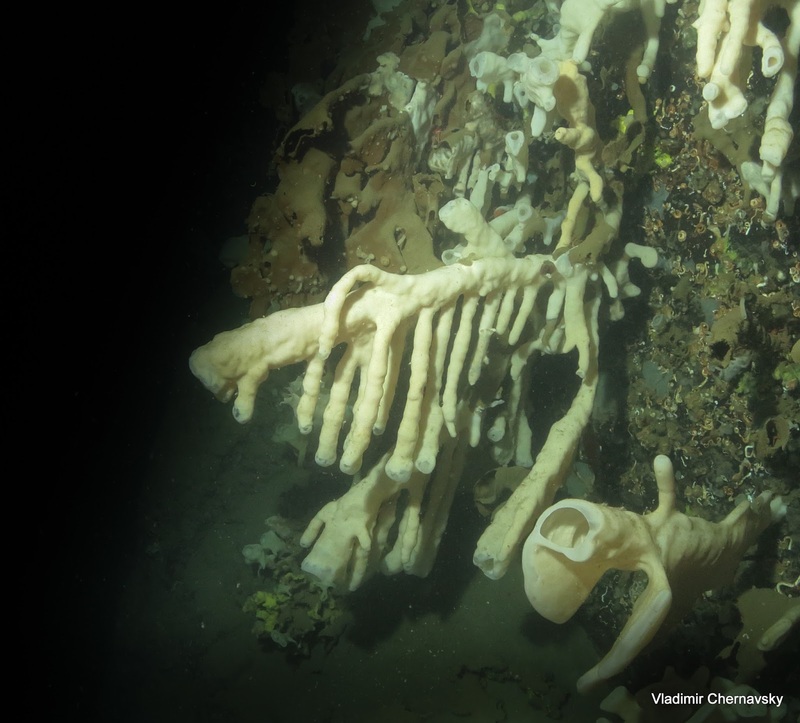 It was located just south of Halkett Bay wall, and was affectionately known as "Sponge Bob". 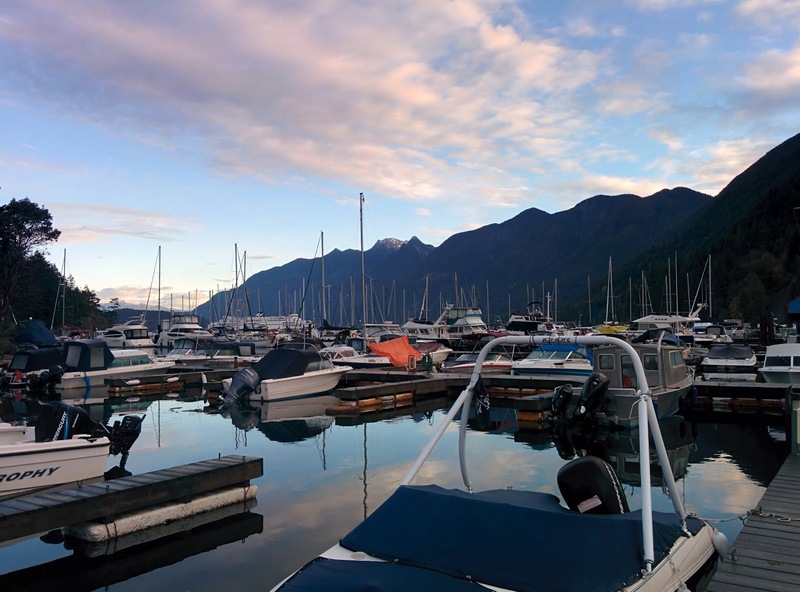 The sponge bioherms in Howe Sound were the only recreationally accessible bioherms in the world! It was quite a privilege to dive them. Jan, Kevin and Barry got the boat set up perfectly, and ensured the shot line we would use for reference was spot on. 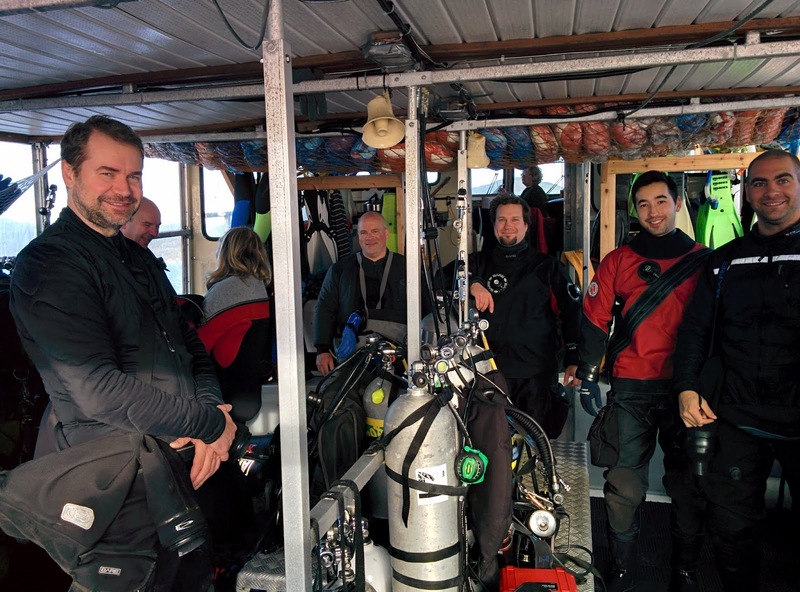 We had three dive teams, two recreational and one technical. Jim, Vlad and I made up the tech team, and checked out the sponges between 39 and 45 meters. They were fantastic as always. I had done this dive four times now, and it has never gotten old. Some of the sponge formations were as big as couches, and some were incredibly intricate and delicate. Vlad had gotten some great pictures on a previous dive, so I included one here. This time around we were just using our eyes for the memories, and no cameras. 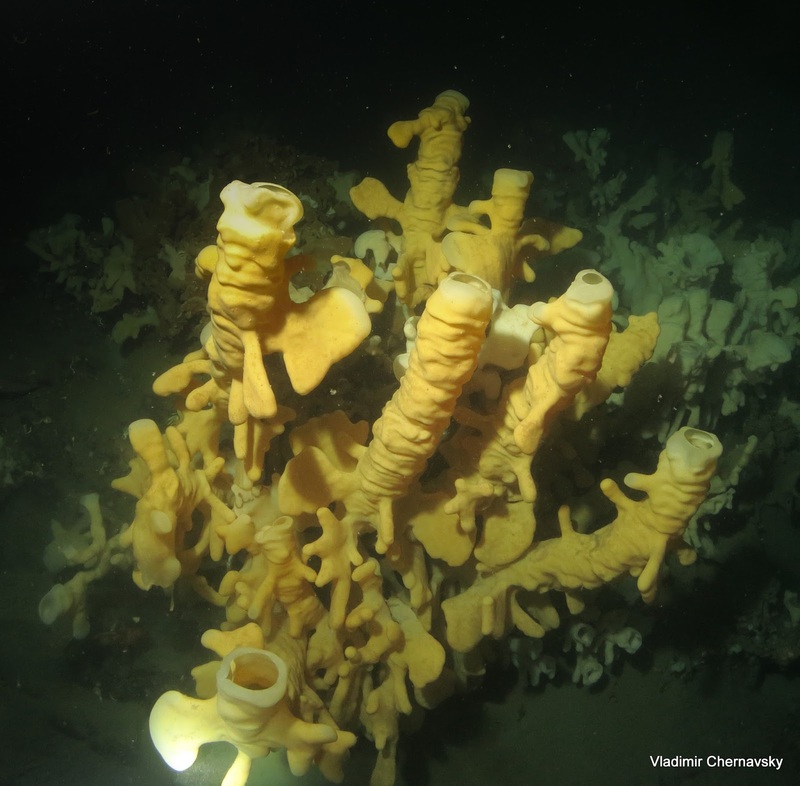 Among the sponges, there were an impressive number of squat lobsters and rockfish. 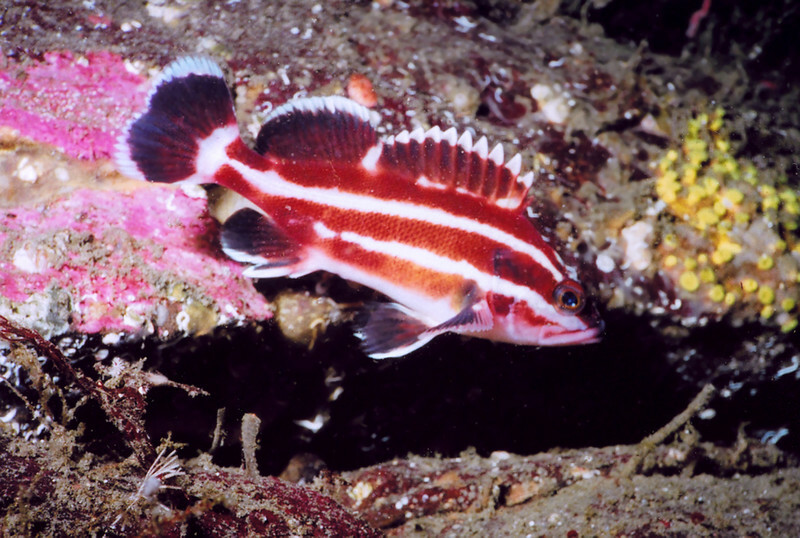 Mostly I saw copper rockfish, but there were a few quillbacks, as well as three juvenile yellow eye rockfish. Normally you didn't see many yellow eye rockfish in Howe Sound at all. This example image was from http://pnwscuba.smugmug.com/REEF/Basic/. Along with the tiger rockfish, the juvenile yellow eye rockfish were one of my favorites. The Citizen Science diver course with the Vancouver Aquarium had really paid off in helping my marine life identification skills! I would highly recommend it. 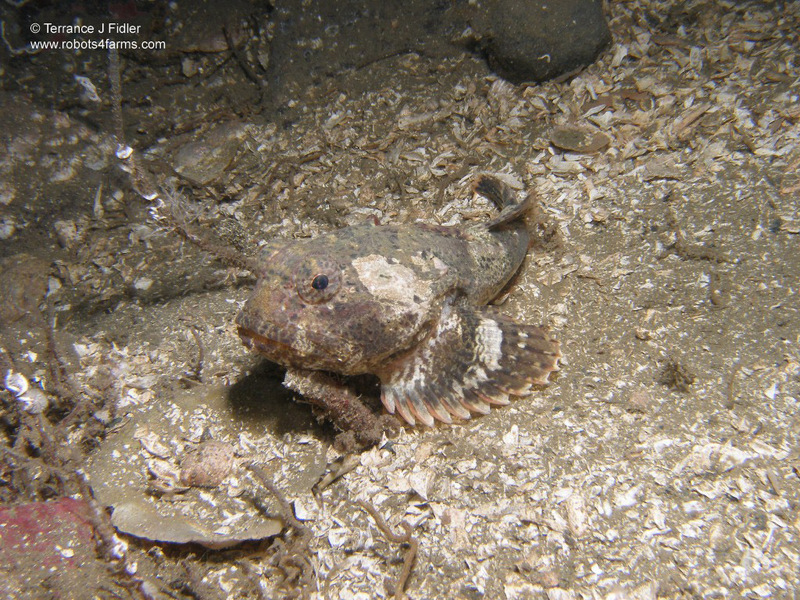 We also came across what I was pretty sure was a buffalo sculpin. This was not my picture, but it was a good example of what it looked like. Nick Bowman got some great video on his dive, and kindly shared it. He also got a great picture of a nudibranch I had never seen before, probably either a Peltodoris lentiginosa or Archidoris odhneri. Yes that was quite a mouthful. Basically it was a glass sponge-eating nudibranch for us normal non-latin people. I found some interesting details here. Nick's video footage, note the impressive octopus was not found on the sponge dive. Read on for that encounter! On our ascent and deco, we didn't deploy our regular surface marker buoy, but deployed a giant six foot marker to help the boat locate us. It took teamwork to deploy the bigger marker, as it took three breaths to inflate it at 21 meters. The person inflating needed to adjust their buoyancy while inflating, and the second team mate had to hold the spool securely. We got the giant SMB up pretty nicely, and the ascent went well. We had some surface current, but not as much as we thought. The surface current ended up pushing us in a bit of a circle. This meant that we didn't drift that far from the boat at all. The giant SMB really dragged you though when you were hanging on to it! 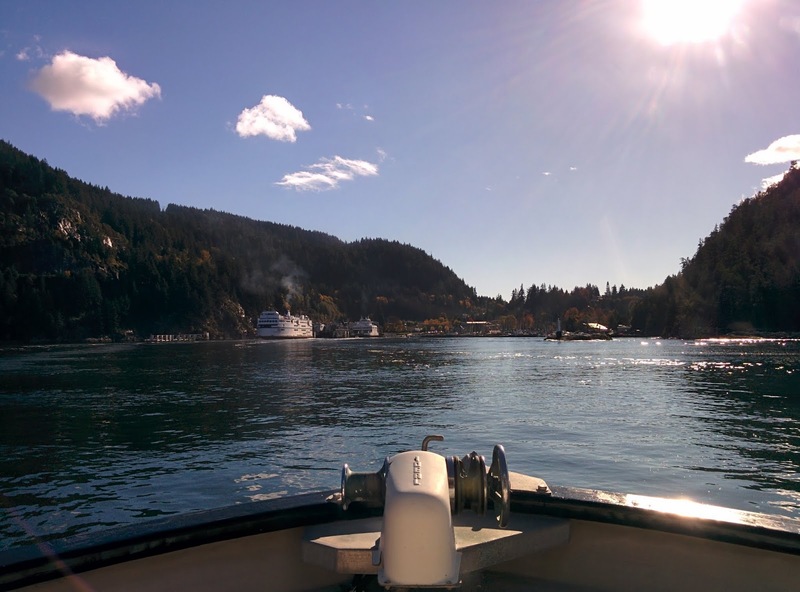 Back on the boat, we had a great surface interval chatting while Kevin motored us over to Christie Islet. We were treated to a lot of cute fat seals on the rocks. I had brought my scooter along as Peter had planned to bring an experimental DiveX scooter. The problem was that Peter had a bad suit leak and so wasn't able to do a second dive. Vlad and Nick had brought their scooters though, so we had a team of three all ready to go. 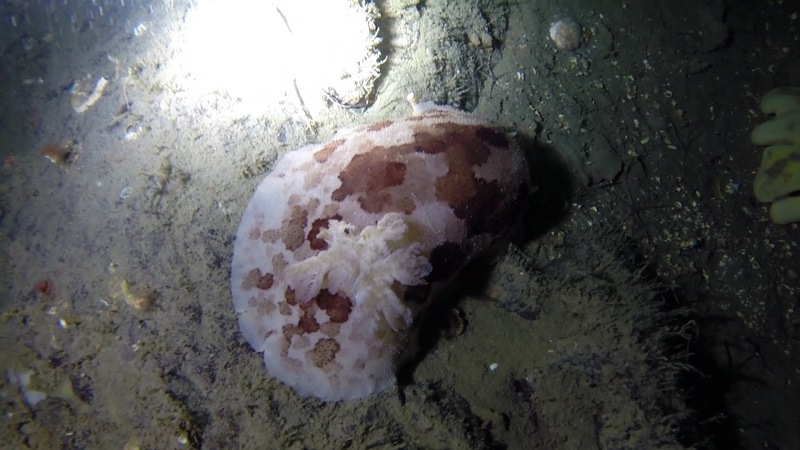 On our descent, we came across Barry and Christina who had found an impressive giant pacific octopus in a crack. Not long into the dive, we discovered that Nick had a problem. His scooter would run for a few seconds, then quit. Vlad tried some troubleshooting as he had a similar scooter, but to no avail. We ended up stowing our scooters and swimming for the rest of the dive. Later, Nick would find that his battery hadn't been charged properly, which was an easy fix. 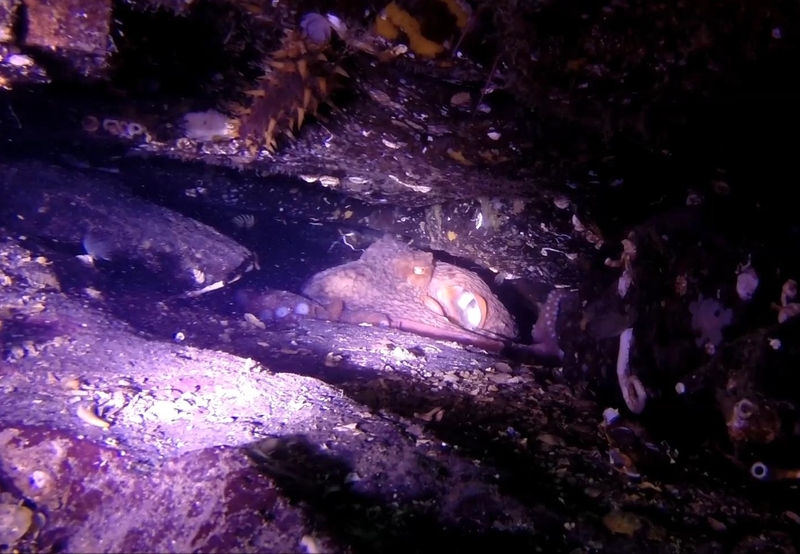 The silver lining was that we came across another, even more impressive giant pacific octopus. In those terms the dive was excellent. Have a look at the video for the octopus. This wall on the north west side of Christie Islet was a real treat. There were hundreds of dungenness crabs in about 20 feet of water, along with very interesting rock topography. Vlad also spied a kelp greenling who ate a fish right in front of him. There was a huge school of perch in the shallows as we ended our dive. It was truly a great dive. I could understand why there were so many octopus here, what with all the crabs and places to hide. Too soon, the trip came to a close. Here was a picture on the way back in to Horseshoe Bay. After the dive, most of us met for some food and beverages at the Olive and Anchor. It was a great conclusion to a great day of diving, with great people and great conversation.